LOVE this! I had been looking everywhere for the navy blue in my size so was thrilled to find this retailer. It is a beautiful deep dark navy blue (real blue black). The quality is amazing, as should be for this price. Delivery was fast and came wonderfully packed. Customer Service was also brilliant when I called up (as was not sure had ordered the right one). Re sizing, it is meant to be fitted, so do bear that in mind. Especially around the hips. Although it does have a double-zip so you can release the bottom of the jacket if you wish. So would measure yourself to be sure. 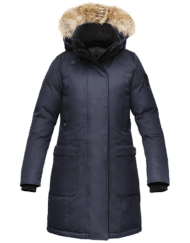 Checked with the Canada Goose website and it is a legitimate supplier, which have also verified since I received the coat. Thank you so much! I shall definitely order one for my partner soon.